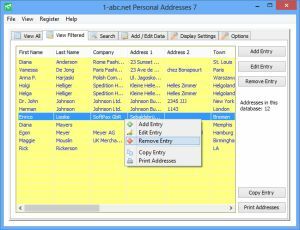 1-abc.net Personal Addresses - Organize your personal contact data easily! While in our opinion the main focus of address data bases should still be the data itself, that it can be accessed very fast and that the way to it should not be overloaded with features that you never need, most possibilities to save your personal contact data unfortunately fail when you really check out these main questions. Isn’t it annoying that most data base programs show you a splash screen for a few seconds before you can start to search just for a simple address? Doesn’t it bore you to be asked after each single change if you want to save the data or not? And don’t you get angry when you think about the high price you have to pay for a big office suite when you just want to find out the telephone number of a friend? We understand you, because we think the same way. So we decided to develop and release 1-abc.net Personal Addresses. Based on the famous SQLite structure this program organizes all your contact data. The program starts directly after you clicked the icon and anything you enter is saved automatically. Of course, even if we managed to develop a very easy to use program, it would be no 1-abc.net product, if it would not have some fantastic features too. You can search for single entries using wild cards in each part of it. You get a result table with all entries matching your search. You can sort the whole list or the filtered data after each column. And you can decide by your own where the data base file is located and even network drives are possible so that 1-abc.net Personal Addresses can be installed on another computer than the data is saved. 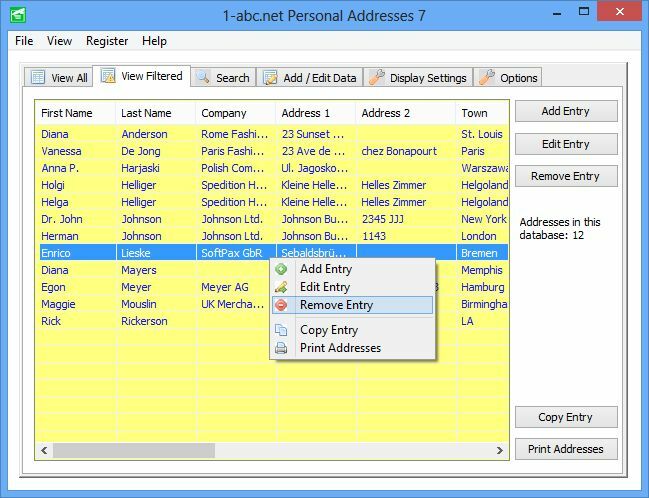 Switch between different address data bases, encrypt your address data with a personal password using the famous AES encryption, export addresses to *.txt, *.csv or *.sqlite, print all your addresses or only filtered data in the order you want ... you see, managing your contact data with 1-abc.net Personal Addresses is so easy that it can even be fun!